King Cakes are a southern Louisiana tradition! King cakes are made by usually braiding three strands of dough into a loose knot and filling with some type of yummy cream filling like bavarian cream or even maple bacon! 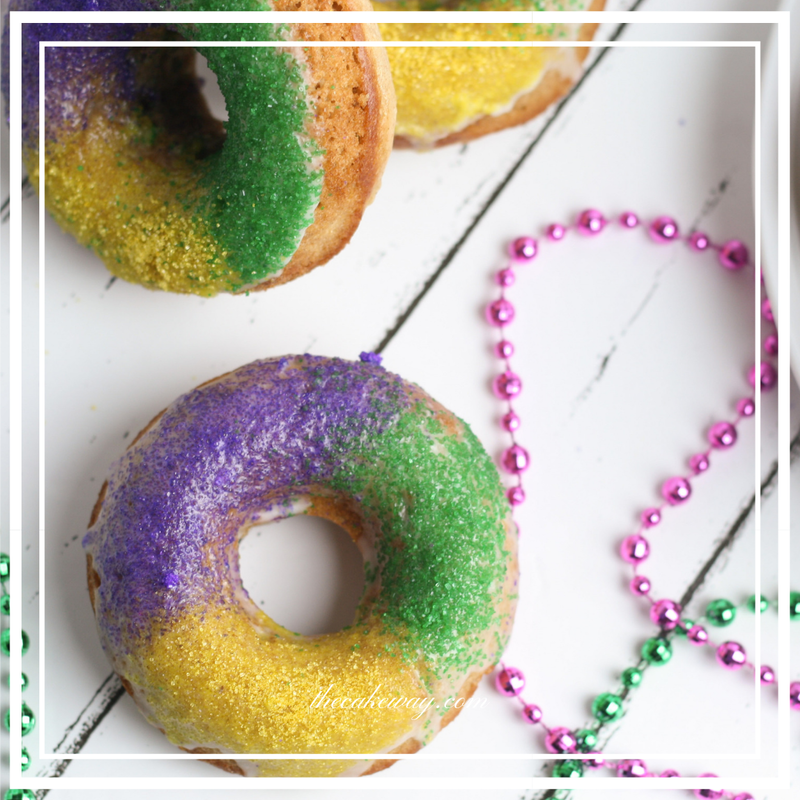 King Cakes are sprinked with traditional Mardi Gras colors of purple, gold, and green and a baby is hidden somewhere in the folds of the dough. The object of the King Cake is that it’s usually something that one gives to another, in an act of kindness, business usually say “Thank You” during this time of year by having said king cakes delivered. Cool, but what’s the deal with the baby. Yes, so the baby in the king cake just continues the tradition of sharing and giving. The person that receives a slice with a baby must gift the next king cake. That’s what’s so magical about King Cakes, they promote giving and sharing! So, of course, the babies are hard, plastic, and not meant to be eaten, LOL! So please provide a full disclaimer to your friends before handing out the mini king cakes that the baby is hidden somewhere! Make it obvious like, leave the baby half sticking out of the bottom or leave the baby underneath one of the donuts just to extra precaution. 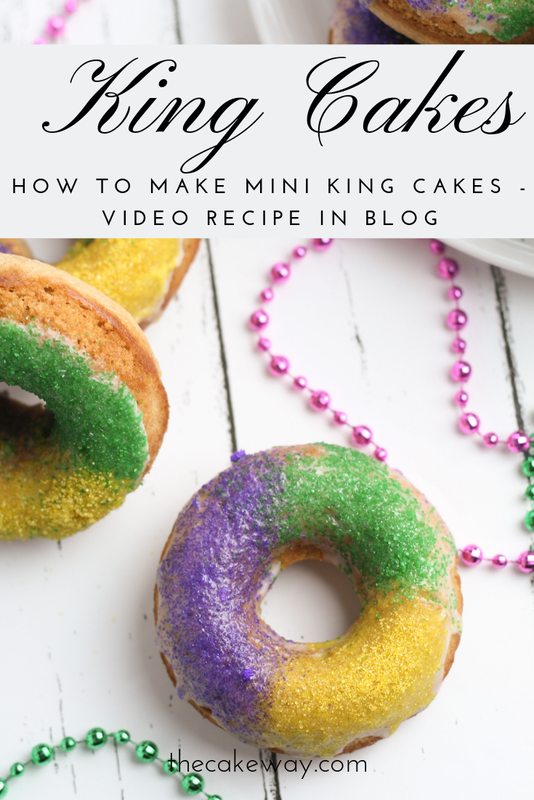 But I’m sure you can see how sharing these Mini King Cakes can be so much fun! Join in the fun and make a dozen today! Whisk together flour, cornstarch, sugar, cinnamon, baking powder and baking soda in a large mixing bowl. In a separate bowl, whisk together milk, eggs, melted butter and vanilla extract. Pour the wet ingredients into the bowl with the dry ingredients and mix with a spoon until just combined. Pour batter into a piping bag and pipe into a greased donut baking sheet. Bake for 8 to 10 minutes, or until the top of the donuts spring back when touched. Allow to cool completely before adding glaze. While the donuts are cooling, prepare the glaze by combining powdered sugar and milk in a mixing bowl. Whisk until ingredients are combined and a glaze forms. Dip each donut in the glaze to cover the top half, then sprinkle purple, green, and yellow sanding sugar over the glaze.